Explore the river valleys of by the Rhine and Neckar by Bike and Barge on this unique self-guided holiday through Germany. Combine riding with river cruising as you sail and cycle from Koblenz to Bad Wimpfen, and visit the famous cities of Mainz, Heidelberg and Koblenz. You will stay on the comfortable MS Patria and each day will bring a new adventure as you explore the beautiful scenery, pretty towns and cultural attractions of this famous region. Embarkation starts at 4pm. The crew will welcome you on board. You will spend the evening and first night in Koblenz. You sail by barge upstream the river Rhine from Koblenz to Boppard. Enjoy the panoram-ic view of the unforgettable Upper Middle Rhine Valley, a UNESCO Word Heritage site. From there you cycle on the left river bank via castles and burgs alongside the celebrated Rock of Lorelei to the beautiful and famous city of Rüdesheim. Overnight stay in Rüdes-heim or in Bingen on the other side of the river. The many picturesque houses and the beauti-ful landscape along the way from Rüdesheim to Mainz make your bike tour an experience. Mainz has numerous churches, museums and historical monuments, e.g. the Cathedral or the Electors Palace, one of the most magnifi-cent of the residences on the Middle Rhine. You cycle via Laubenheim to Nierstein, the biggest vine growing community on the river Rhine, where your will enjoy your lunch on board. Nierstein is a popular destination for exploring the vineyards with a tractor wagon. The ship brings you to Mannheim. From there on you will cycle via the Celtic city of Laden-burg, where you reach the river Neckar first, to Heidelberg. This old city draws tourists from all over the world. Visit the castle. If you would like to learn more about Heidelberg, you can book a guided city tour. After a bike tour from Heidelberg via Ziegel-hausen and through the Odenwald to Neck-arsteinach you will reach picturesque Eber-bach, a nice old town with narrow streets. The quality of the bike paths is very good. You cycle mostly on roads with no or less traffic, side roads and asphalted bike paths along the banks, no noteworthy climbs. Therefore this journey is suitable also for unexercised cyclists. All mentioned distances are ca-distances of recommended bike tours. 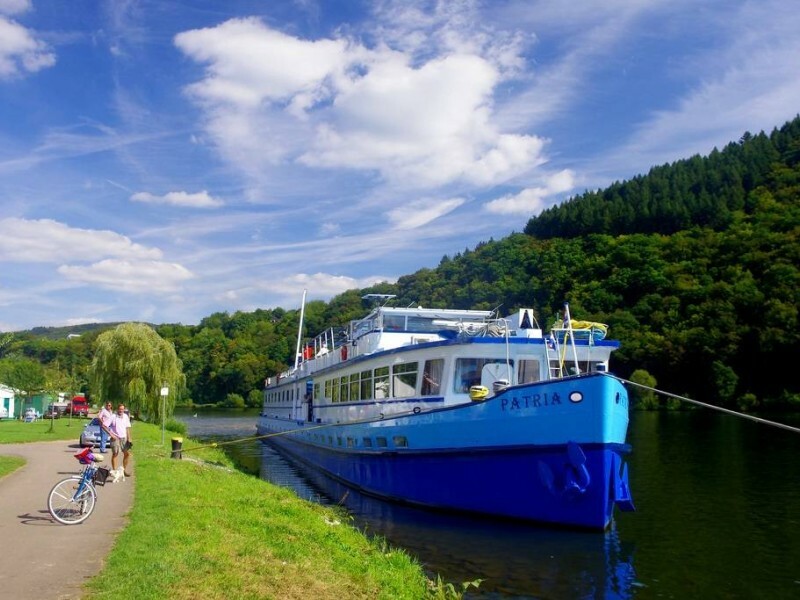 The Bike & Barge: Koblenz to Bad Wimpfen cycling holiday includes accommodation on-board the barge and local support if required. A rustic, comfortable river boat with restaurant and saloon with small bar (air-conditioned). Partially roofed sun deck with seats and storage for bikes. Length 68 m, breadth 7,70 m, space for 66 guests, Dutch flag and captaincy. 14 cabins with air-conditioning on the cabin deck/main deck (windows cannot be opened), 19 cabins on the upper deck/promenade deck (no air-condition, windows can be opened), only twin-bed cabins (about 7 sqm, 2 separate beds), shower/toilet. A word concerning meals on board: good and plenty plain fare is awaiting you.